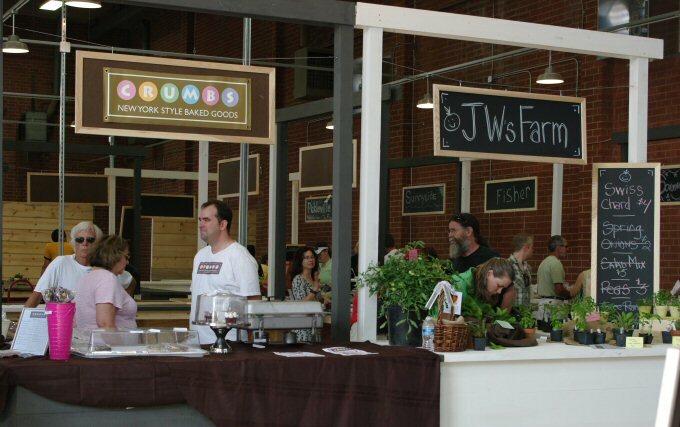 Saturday, May 15th was opening day for the new Atherton Market at Atherton Mill in South End, and my husband and I were there to check it out. The space is great – tall ceilings, covered and protected from the elements, restrooms available. Each vendor has a stall with a chalk board sign overhead, allowing for flexibility if they move around or change vendors. Most had very clear pricing boards stating what was available. There is a market information booth where you can buy reusable Atherton Market bags. 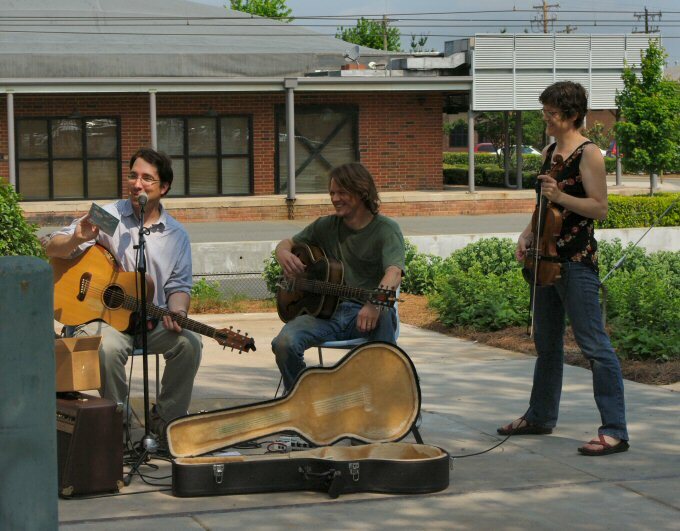 Check out some of the pictures from the event – they even had music from the Mike Strauss Band. Proffitt Family Farms from Kings Mountain. 100% grass-fed beef, no hormones or antibiotics. Two of their pastures were certified organic in September 2009, and one is transitional to become certified organic in September 2010. In about two years, their beef will be certified USDA organic. We met Shelley Proffitt Eagan at the market, and she is passionate about raising cattle. (According to some info on their website, she rock climbs, too!) The farm started out as her Dad’s, but now it’s a whole family effort. We’re going to try the hangar steak in fajitas this week and see what the flavor is like compared to other grass-fed beef we’ve had. 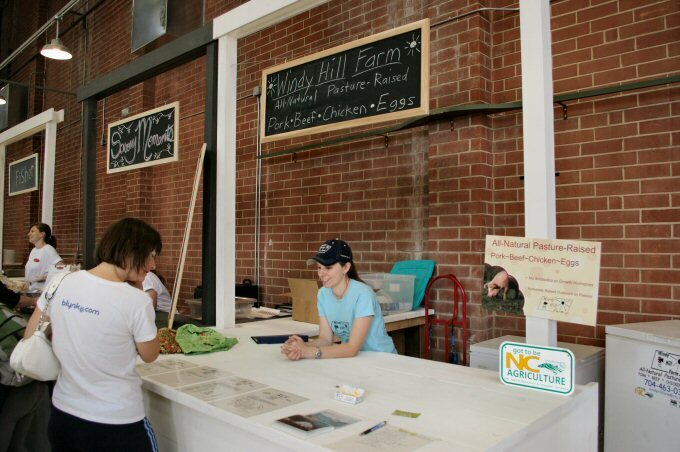 Windy Hill Farm – pork, beef, chicken, eggs. They’re a small, family owned farm in New London, NC, (out near Albemarle). They use no hormones or antibiotics. We spoke with Dana and looked through pictures of her farm. The great thing about their chicken is you can get it fresh if you call ahead. She actually had one whole fresh chicken left when we spoke to her, and it had just been processed by her husband the day before. A great advantage if you’re doing the rotisserie. We have other local chicken suppliers with great chicken, but they come frozen. We are going to give their pork chops a try – those are frozen. The Pasta Wench – Andrea Morrell is the Pasta Wench and runs her small, family-operated company out of the Boone – Swannanoa, NC area. 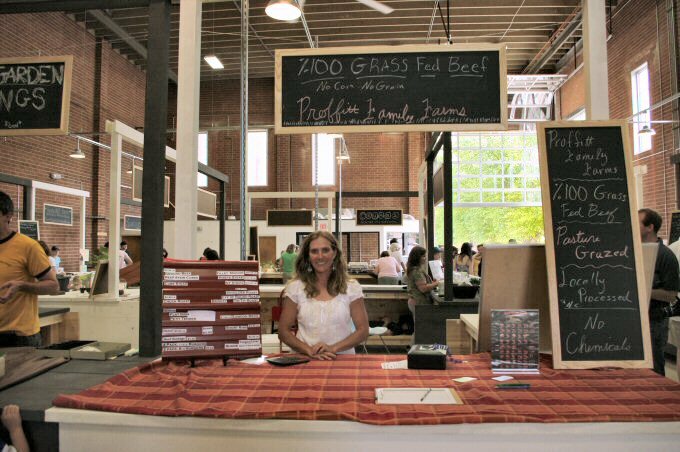 They create all natural gourment pasta and sauces with 95% organic ingredients from NC growers. We met Jessica at the stand, and she was making a call for more pasta to be brought to market because she was running out. We managed to snag some roasted red pepper ravioli. 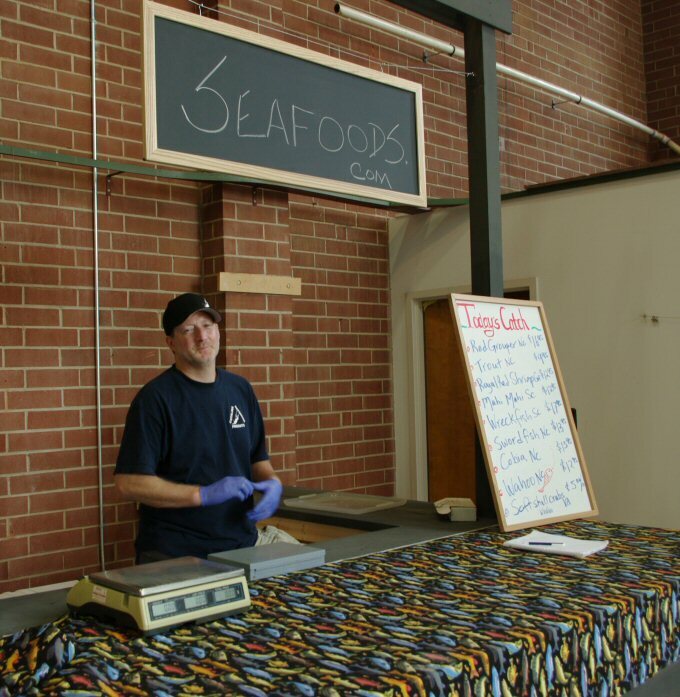 Seafoods.com – During the week, Mike runs a wholesale seafood business. He’s been trying to get into the local markets and is happy to be at Atherton Market. Mike carries seafood primarily from NC and SC, with a little from GA and FL. We tried the trout, which was caught near Brevard, NC. It was very good in the fish tacos that we had. Crumbs – A “New York style” bakery, Crumbs is currently baking out of a commercial kitchen. Owner Brian hopes to have a space by the end of the year. Meanwhile you can find their cannoli cakes, cupcakes and cookies at Atherton Market. We tried the Carrot Cake Cookie (two large carrot cake cookies with a layer of frosting in between), and it was yummy! 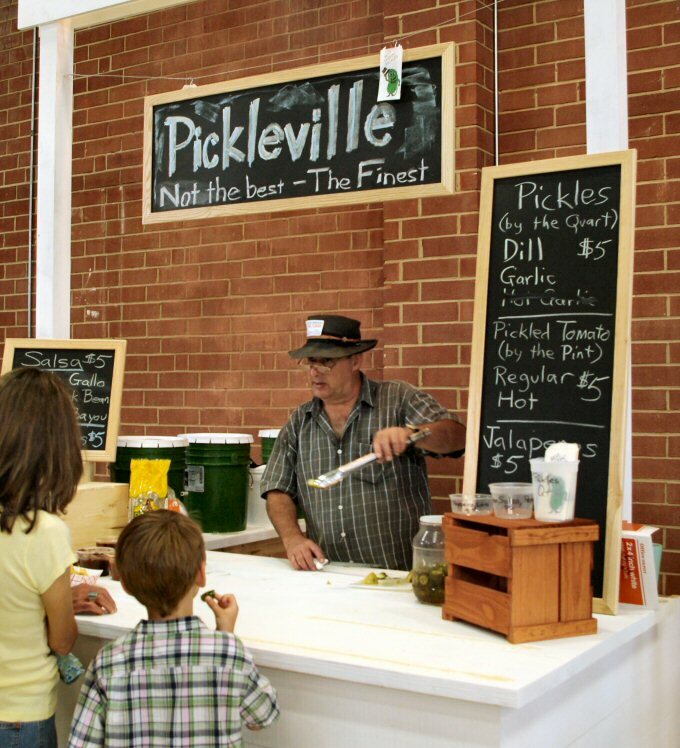 Pickleville – This was by far my favorite stand. We met Bill the pickle man and sampled dill pickles and pickled green tomatoes. Loved the tomatoes so much, we just had to take some home. Will be back for more. 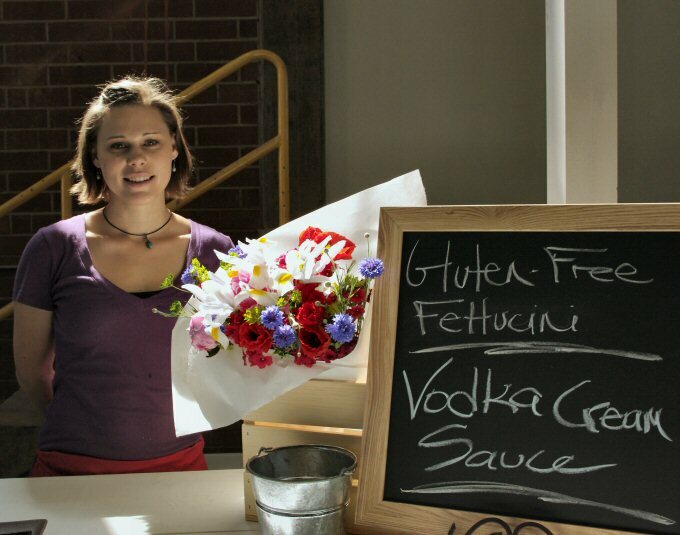 This entry was posted in Farmers Markets, Local, Uncategorized and tagged Farmers Markets, Local. Bookmark the permalink.